John Gibson (born July 14, 1993) is an American professional ice hockey goaltender currently playing for the Anaheim Ducks of the National Hockey League (NHL). Gibson was ranked first among North American goaltenders in both the NHL Central Scouting Bureau's preliminary and midterm rankings for the 2011 NHL Entry Draft. On June 24, 2011, Gibson was drafted in the second round, 39th overall, at the 2011 NHL Entry Draft by the Anaheim Ducks. Prior to his selection, while still playing with USA Hockey's National Team Development Program, he committed himself to playing college ice hockey at the University of Michigan, which competes in NCAA's Division I in the Big Ten Conference, for the upcoming 2011–12 season. However, on July 27, he opted out of his agreement with Michigan to instead play major junior ice hockey for the Kitchener Rangers of the Ontario Hockey League (OHL). During the following season, 2012–13, Gibson was selected to represent the United States at the 2013 World Junior Ice Hockey Championships. He was the team's primary goaltender throughout the championship, registering a .955 save percentage and a 1.36 goals against average (GAA) in seven games for the eventual gold medal winners. His save percentage led all goaltenders in the tournament and he was named as the tournament's best goaltender. He was also named to the tournament All-Star Team, as well as named the tournament's most valuable player. 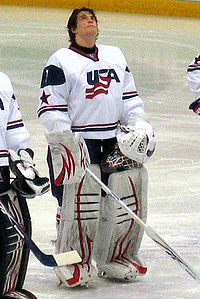 Gibson also won a bronze medal at the 2013 IIHF World Championships with Team USA's senior squad, posting a 1.56 GAA and .951 save percentage in the tournament. Gibson made his professional debut with the Norfolk Admirals, the American Hockey League (AHL) affiliate of the Anaheim Ducks, on April 19, 2013, playing 40 minutes in relief. With the off-season acquisition of Anton Khudobin, rumors sparked of Gibson being traded elsewhere, which was promptly put down by Ducks general manager Bob Murray. On September 21, the Ducks announced that they've signed Gibson to a three-year contract extension, worth reportedly $6.9 million. He also began the 2015–16 season with the new AHL club San Diego Gulls. When Andersen had the flu, Gibson was recalled on November 24 and started when the Flames met the Ducks in which the Ducks won 5–3. Gibson started for the next 9 games posting a 4–4–1 record. On January 6, 2016, it was announced that Gibson was selected to his first All-Star Game. On August 4, 2018, the Ducks re-signed Gibson to an eight-year, $51.2 million contract extension worth $6.4 million annually. Gibson represented Team North America at the World Cup of Hockey 2016. ^ "John Gibson (b.1993) hockey statistics and profile at hockeydb.com". hockeydb.com. ^ Brehm, Mike (January 10, 2011). "Swedish pair leads draft rankings; USA's John Gibson is top goalie". USA Today. Retrieved May 29, 2011. ^ "Gibson Commits to the University of Michigan". USHL. December 21, 2010. Retrieved May 29, 2011. ^ "Player Statistics by Team: USA" (PDF). IIHF. Archived from the original (PDF) on October 17, 2013. Retrieved January 7, 2013. ^ "Goalkeepers" (PDF). IIHF. Archived from the original (PDF) on October 17, 2013. Retrieved January 7, 2013. ^ "US wins gold at junior ice hockey worlds". Associated Press. Retrieved January 7, 2012. ^ "Shootout Win Earns USA Bronze". IIHF. Retrieved May 21, 2013. ^ "2013 IIHF Ice Hockey World Championship Goalkeeper Statistics" (PDF). IIHF. Retrieved May 21, 2013. ^ "Admirals Fall in Syracuse, Now in a Four-Way Tie in Playoff Race". Norfolk Admirals. Retrieved May 21, 2013. ^ "Anaheim Ducks at Vancouver Canucks – 4/7/2014". National Hockey League. April 7, 2014. ^ "Perry, Gibson Named to 2016 NHL All-Star Game". National Hockey League. January 6, 2016. Retrieved February 24, 2018. ^ Teaford, Elliott. "Ducks give John Gibson 8-year extension on his wedding day". Orange County Register. Retrieved 4 August 2018. ^ Seidel, Mark (April 26, 2011). "Prospects report from world Under 18s". CBC Sports. Retrieved May 29, 2011.